if you are looking for Yahoo/MSN Group downloader, Please check http://www.groupfetch.com for details. This new release contains the following features and it will be worth to test them. Hi ! I am Guru Ramnath Kathiresan. Welcome to my New GRE Word List Reviewer Page, a site dedicated to all those individuals aspiring to crack the GRE! For many who have been searching endlessly for a software that could assist you in attacking those tough GRE ,GMAT tests, here comes Guru's GRE WordList Memorizer as a final ray of hope. 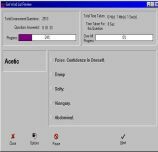 The GRE Word List Reviewer is a smart tool that incorporates Microsoft Corporation's Speech Synthesizer to deliver a quality audio assisted pronunciation and memorizing mechanism. The origin of this wonderful new tool goes back to the days when I myself was in the arduous preparation for the GRE. I came upon the idea of developing a simple tool that could assist me and many others to memorize those tough words in the Barron's GRE Word List while, at the same time getting their pronunciation right. It also helped me a great deal in tackling the TOEFL, because the audio accompaniment familiarized me with the American accent. It is my greatest desire that everybody visiting my site be benefited greatly by trying out my GRE Word List Reviewer. I hope you enjoy using this program as much as I enjoyed creating it. But Dont Download the File from them, because they have given a wrong link. Comments and suggestions are greatly appreciated and will be thoroughly reviewed and implemented in the next release. A great many people in India felt that they were not able to download the GRE Wordlist program because of its size (7.7 MB) a huge burden on the low bandwidth telephone lines. 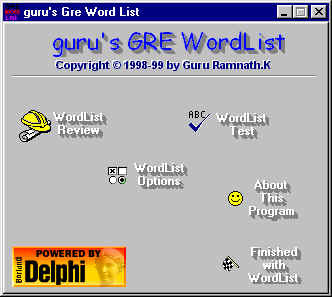 I made an arrangement with a company called Dhanu Videos to supply the GRE Wordlist program on CDROM. The cost of the CDROM is approximately Rs.125 (Indian). This service is only applicable to people residing in India. Please Note: Though this tool was meant to be distributed as charityware, certain expenses could not be avoided which include cost of recording media, duplication costs etc. Also to be noted is the fact that 20% of the revenue generated will be set aside as donations made to charity. This package comes with additional free software which will make your preparation for the GRE a smooth sail. Apart from the above mentioned programs you'll get a host of utilities compiled from the very best freeware sites. If you have a low speed Internet connection, it will take atleast 5-7 hrs to complete the downloads. So I would suggest you to get a copy in a CD. Make money order/ DD payable to Dhanu Videos. Please include Rs.30 for shipping/postage (Indian users only). If you are living in Chennai, you can directly visit or give a call to Dhanu Videos to buy the CD. Covers almost all words listed in Princeton Review, Barron's and Kaplan word lists. WordList Reviewer with Speech Support. Easy Custom-Timed Navigation of each word, so that you can sit back and study the Wordlist without touching the mouse or keyboard. Option for navigating the words that are incorrectly answered in the test. Custom tips editor for each and every word. New improved look and Feel. Guru's GRE Wordlist is a charityware program. You are allowed to use it for an unlimited period of time, and you may freely distribute it, provided you register it (Just an email is enough) and YOU DONATE TO A REGISTERED CHARITY AN AMOUNT THAT YOU FEEL FAIR. "guru's GRE Wordlist is supplied as is. The author disclaims all warranties, expressed or implied, including, without limitation, the warranties of merchantability and of fitness for any purpose. The author assumes no liability for damages, direct or consequential, which may result from the use of guru's GRE Wordlist." If you have any problems with this program, please drop me a mail (to gururamnath@yahoo.com). Please include a complete description of your problem, the exact point at which it happens, any error messages, and anything else that may be pertinent to the problem. If you want keep in touch with me and Other GRE Wordlist users you can join the Yahoo Group's Discussion forum. Just drop an email , and kindly DON'T FORGET TO GIVE AWAY A FAIR AMOUNT TO CHARITY. Please add your Comment in my Guest Book . The Latest GRE WordList reviewer can be downloaded from the links given below. If you have problem downloading the files, check out the GRE WordList's Yahoo Group. I would appreciate you leaving your impression about this software in the CNET user Opinion Area. Keywords : free grewordlist , free GRE , GMAT , TOEFL MAT wordlist , free GRE , GMAT , TOEFL MAT word list , GRE , GMAT , TOEFL MAT wordlist for all , guru's GRE , GMAT , TOEFL MAT wordlist , Everyones's GRE , GMAT , TOEFL MAT wordlist , GRE , GMAT , TOEFL MAT wordlist for you.